Computing Comfort from Weber Knapp. The SlimForm 19in Keyboard tray lets your wrists rest on smooth gel pads. Mouse side tray keeps the mouse in line with your keyboard and stress off your joints. – Keyboard tray of 20" X 11" X 3/8" with PVC covering in graphite gray. 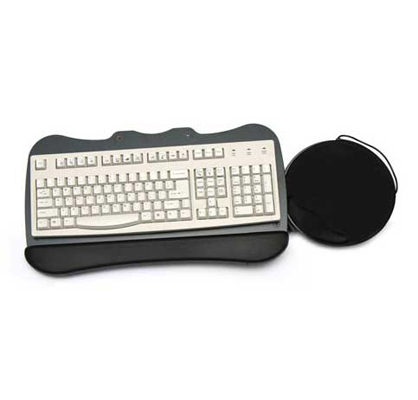 – Keyboard and mouse trays both swivel 360 degrees and tilt +/- 15 degrees. – Easily changes from the standard Right Hand to a Left Hand Mount. 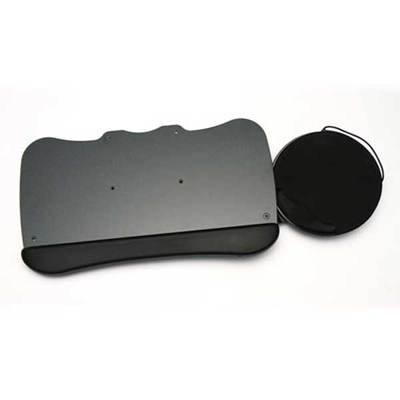 – Tray palm rest and mouse pad rest are gel with a durable lycra covering. – Includes adjustable mouse catcher with cord manager. – Mounting hardware and (4) keyboard adhesive backed anti-skid pads included.